You can’t tell a harvest by its appearance – Forest Works! Can you tell good forestry from bad forestry when you see it? The three photos above all depict logging operations that have made dramatic changes in the landscape. Two of the photos illustrate good forestry that takes care of the long-term health of the woods. 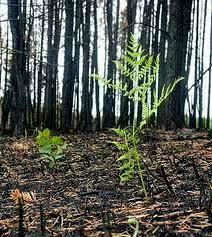 One of the photos depicts poor forestry and short-term management. The photo on the left was a December 2012 harvest conducted in Vern Walker Wildlife Management Area in Newfield to mimic the effects of naturally occurring fire in the pine ecosystem and to encourage habitat for rare butterflies and moths. Check good forestry. The photo in the middle was a 2010 harvest conducted at Highland Farm Preserve in York to create “early successional habitat” attractive to New England cottontail rabbit and many kinds of birds. Check good forestry. The photo on the right was taken in April 2010 of a high-grade harvest in Alfred in which the trees of commercial value were taken. Check poor forestry. conducted as part of long-range plan for forest improvement is far different than a clearcut done with no regard for the future health and productivity of the woods. To illustrate the varied and multiple motivations behind successful timber harvesting, we’ve started an information exchange called “Share My Harvest” stories cataloged on the Forest Works! website.